Hi,Users Here is Another Great offer on Recharge Where You Can Get Upto 100% Cashback On Google Play Gift Card Recharge Via Paytm, Freecharge And Phonepe wallet. You Can Use These Gift Cards to purchase your favorite Indian and international digital entertainment like games,App,Ebooks,Movies &Much More Without Using Any Credit Card. follow below Mention Steps To Avail The Offer. *Customer will receive the below-mentioned vouchers on successfully applying this code. *1 movie voucher worth Rs.100. *Vouchers will be sent only if the code is applied successfully. *Apply the movie voucher at Paytm while booking movie to receive the cashback. *Movie voucher will be valid on booking of minimum of 2 tickets. *Movie Vouchers are valid for 1 Month. Use Promocode MALLRECH50 to get 1 voucher of Rs 50 applicable on mobile recharge. *Mobile recharge: TnCs-* Applicable on payment of 1 On Mobile Recharge through Paytm . *Mobile recharge voucher of worth Rs.50. * Valid for 30 days after 10 days of delivery of product. Same voucher can be use 1 time, Valid for all the users. *Cash back will be credited within 24 hours of the transaction into the user's Paytm Account. - Use Google Play™ Gift Cards to purchase your favourite Indian and international digital entertainment - no credit card needed. - Choose from millions of games,apps,ebooks,movies and more on the Google Play store. - Whether you’re at home or on-the-go,you can redeem your gift card on the Web or any Android device. - Use a gift card for your own purchases or give it to a friend - it's the ideal gift for any occasion. How To Recharge Google Play Gift Card From Paytm/Freecharge? 6. Google Recharge Code & Pin Will Be Delivered To Your Mobile And Email Id within 24 Hours. 7. 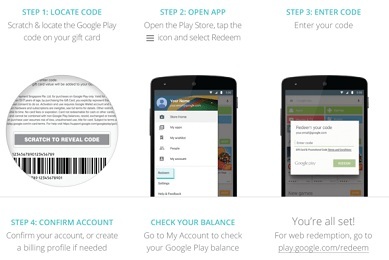 Go To Play.google.com/redeem on web OR Launch The Google Play Store App On Your Phone And Select The Redeem Option. 8. Enter The Google Play Recharge Code & Pin To Redeem It.